Leader in personalized digital photo products deploys Oracle WMS for standardization, increased accuracy, and maximum efficiency. Shutterfly was looking for a way to automate and streamline their warehouse operations. They wanted to free their workforce from time-consuming manual data entry and the associated lag times. The initial aim of the warehouse was to keep sub-inventories to be stocked in order to prevent any production stoppages. Any time product inventory was lacking, the teams were slowed, hindering business during periods of high activity. Following Gaea’s implementation, Shutterfly realized $125,000 in labor efficiencies per year. According to Ralph, Shutterfly’s Phoenix warehouse manager, “the biggest cost savings realized for my team is that we are not searching for locations of product since the system directs us. This may save as much as a minute per task.” The costs saved after the initial rollout in Shutterfly’s Phoenix and Charlotte sites are impressive. After implementing Oracle WMS, Shutterfly saved 66-84 hours per floor replenishment cycle per week for an annual savings of $74,300. They were also able to eliminate the need for end-of-month cycle counting, which saved about 50-60 hours per month, or $14,500 annually. Receiving time was reduced by an average of five minutes per pallet, resulting in an annual savings of $37,000. 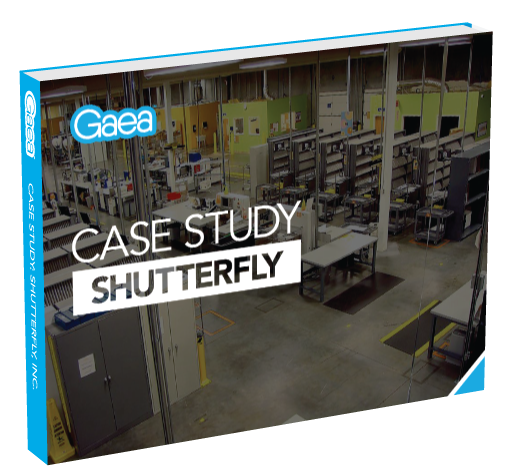 To learn how Gaea helped Shutterfly achieve this ROI, download the full case study.